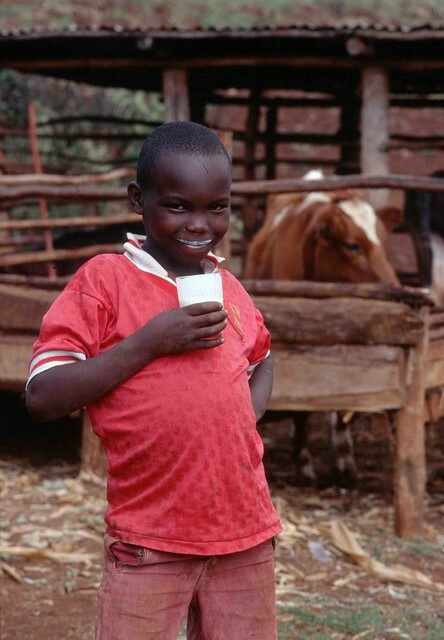 Kenyan boy drinking milk (photo credit: ILRI/Dave Elsworth). A new research paper by scientists at the International Livestock Research Institute (ILRI) and partner organizations confirms that milk, meat and eggs are widely consumed by poor people in Kenya’s capital city of Nairobi: these animal-source goods make up nearly 40% of the food budget and half of this is spent on dairy products. Economic analysis revealed a high propensity to consume animal-source foods and elasticities showed that, if their prices could be lowered, consumption of animal-source foods would rocket, benefiting both the nutritional status of poor consumers and the livelihoods of small-scale livestock producers. ‘Malnutrition, including undernutrition and micronutrient deficiencies, is a chronic problem in most developing countries. Animal-source foods (ASFs) provide essential sources of proteins and micronutrients, yet little is known about ASF consumption patterns or household preferences towards animal-source products among low-income populations. This is particularly critical for malnourished children for whom even small increases in consumption could help improve nutrition and health outcomes. This study analysed both the demand as well as the drivers and barriers for ASF consumption among households in two low-income areas in Nairobi, Kenya. ‘On average households purchased 48 grams of ASFs, including fresh milk, per week per household member. Expenditure on ASFs counted for 38% (520 Kenyan Schillings) of the overall food expenditure of which, on average, 48% was spent on fresh milk. Price was the most commonly self-reported barrier for consumption, while taste was reported as the main driver for consumption. The perceived nutritional value was an important driver for consuming more commonly purchased ASFs (beef, eggs, fish and milk). For less commonly purchased ASFs (pork, sausages, sheep and goat meat, offal) taste, access and tradition were given as main reasons for not consuming. Estimated demand elasticities indicated that increases in total food expenditure would lead to greatest increase in the demand for beef meat. Price reductions would increase the demand relatively more for fish, other meats and dairy. ‘For most ASFs better affordability would be a clear driver to increase the consumption. However, to increase the variety and quantity of ASFs eaten, other policies targeting improvements in physical access, food safety and consumer education on nutritional values and cooking methods should be considered. ‘Despite improvements in child malnutrition in Kenya since the early 1990’s, the rate of undernourished children remains high. Nationally 35% of under 5 year olds are stunted, 16% underweight and 7% wasted. In urban informal settlements, prevalence of stunting among under 5-year-old children can be even higher, and has been reported to exceed 40%. Elsewhere, it has been suggested that nearly half (48%) of Nairobi’s households living in informal settlements are food-insecure with both adult and child hunger. Historically, diets in Kenya have been cereal based, with additions of a variety of vegetables, fruits and tubers, when available, but containing very little animal-source foods (ASFs). ‘According to the World Food Program consumption score, 16% of households in Nairobi were classified into the borderline or poor food consumption groups, indicating food insecurity, and were, in general found to have low intake of milk and animal-source foods (ASFs). ‘While the supply of ASFs, including meat, milk and eggs has been steadily growing in African countries since the early 1990s, including in Kenya, consumption inequalities are high. Based on the 2005–06 Kenyan household survey data, the poorest tercile consumed 35 g of protein (from all sources) per capita/day, whereas households in the wealthiest tercile consumed 81 g. In Nairobi, households in the highest income quintile consumed annually nearly three times more of beef, chicken and eggs (46 kg per capita) as the households in the lowest quintile (16 kg per capita). Micronutrient intake from ASFs is critical for vulnerable populations, and in particular for undernourished children. ASFs are relatively expensive sources of energy but provide high quality, readily digested protein, and essential micronutrients for normal development and good health. Bioavailable micronutrients found in ASFs, and in meat specifically, are difficult to obtain in adequate quantities from plant source foods alone. ‘Recent reviews of literature in low-income countries in general, and observational and interventional studies from Kenya, have concluded that increased consumption of milk and other ASFs by undernourished children improved anthropometric indices, cognitive function and school performance, while reducing also morbidity and mortality. In addition, ASF consumption has also been found to have a positive impact on the quality of diets for women, and specifically for pregnant and breastfeeding women. ‘Poverty is often cited as the most prominent reason for the lack of ASFs in the diet in developing countries. Most recent and comprehensive study examining the demand sensitivity to prices and income changes in Nairobi, found that poor households spent a greater share of the total food expenditure on staples such as maize, sugar and also vegetables while non-poor households spent more on wheat, rice, and ASFs (dairy and dairy products, beef, poultry). They also found more sensitive demand with respect to changes in prices and incomes among poor households for dairy, vegetables, fruits, sugar, poultry, beef, wheat and rice. Another study looked at the demand for small ruminant meat specifically focusing on areas (including in Nairobi) near a slaughterhouse of sheep and goats. They found that the price of meat, income and perception of the quality of the meat were important factors influencing the probability of the demand for such meat. ‘. . . Understanding these broad range of drivers in ASF choices is even more critical, but little studied, among poor and vulnerable populations because of their relatively lower food budgets and thus limited possibilities for diversifying food consumption. This study is part of a comprehensive pilot project ‘Investigation of the relationship between livestock value chains and nutritional status of women and children: a pilot study in Kenya’. The aim of the project was to inform research and design of interventions in livestock value chain to address the low consumption of ASFs among vulnerable populations, and in particular, the large share of chronically malnourished young children. . . .
Read the science paper: Cross-sectional study of drivers of animal-source food consumption in low-income urban areas of Nairobi, Kenya, by Laura Cornelsen (London School of Hygiene and Tropical Medicine [LSHTM] and the Leverhulme Centre for Integrated Research on Agriculture and Health [LCIRAH]), Pablo Alarcon (LCIRAH and Royal Veterinary College [RVC]), Barbara Häsler (LCIRAH and RVC), Djesika Amendah (African Population and Health Research Center [APHRC]), Elaine Ferguson (LSHTM), Eric Fèvre (ILRI and University of Liverpool), Delia Grace (ILRI), Paula Dominguez-Salas (ILRI and RVC) and Jonathan Rushton (RVC and the University of New England), in BMC Nutrition, 25 Nov 2016. Tags: ASFs, BMC Nutrition, Delia Grace, Eric Fevre, Paula Dominguez-Salas. Bookmark the permalink. Very interesting finding that I am sure applies to other developing countries. Recently we analyzed the applicability of the Livestock Revolution concepts (Delgado et al, 1999) to Central America, and found that even though in the last 50 years the household income almost doubled or even increased three times in some countries, the increase in per capita consumption of beef, pork, mutton and milk has not been very high; whereas there was an important growth in per capita poultry meat consumption (I haven´t check the case of fish), but we assume this was the result of policies favoring commercial poultry production and the importation of poultry meat, making those more accessible to the low income families, as prices were lower due to subsidies on grains importation.